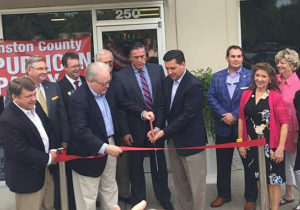 Local Republican leaders were on hand for the ribbon cutting of the new Johnston County GOP Headquarters Wednesday afternoon. The county GOP headquarters is located on Venture Drive in Smithfield. Congressman David Rouzer, Congressman George Holding, Representative Larry Strickland, Representative Donna White, Register of Deeds Craig Olive, Judge Paul Holcombe and County GOP Chairman Darryl Mitchell were among those in attendance.